Clearing up after the disaster. It is August 19. Driver Gerard Przyjemski reports for duty at Torun Glowny about 03:20. He is booked to take train 5130 to Lodz Kaliska which is due to depart at o3:37. But his train is held beyond its scheduled departure time awaiting a connecting train from the seaside resort of Kolobreg which is running late. Finally the connecting train arrives, passengers rush from one train to another. Two couchette coaches full of children returning home from summer camp are detached and attached to the rear of his train. At 04:18 Przejemski is given the command Odjazd! (Right away!) and starts easing his train out from Torun Glowny. Train 5130 consists of Torun Glowny-based diesel locomotive SP45-160 and 7 passenger coaches – 5 ordinary coaches and the two couchette coaches at the very rear. Przejemski builds up speed until he is travelling at a steady 55 mph. At 04:28 train 5130 passes the block post at Brzoza Torunska. As it passes the block post the line controller receives a phone call from the main signal box at Otloczyn, ‘Oc’, that freight train 11599 has made an unauthorised departure from a holding siding at Otloczyn and is proceeding ‘wrong line’ towards Broza Torunska. With no way of contacting either of the drivers horrified signallers and line controllers can only await the inevitable. At 04:30 Przejemiski sees the freight train coming round the bend. He applies the brakes and dives onto the ground of corridor next to the engine. Przjemski’s train is moving at 85 km/h, the freight train at 33 km/h. Przejemski was lucky, and though seriously injured, survived. 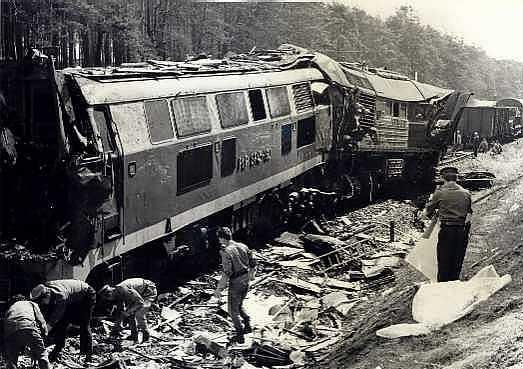 His second man, the driver and second man of the freight train and 64 other people were killed. 64 people were injured. Otloczyn is etched into the memories of railwaymen as Poland’s worst railway accident since WW II. Otloczyn – signals and sidings at the time of the accident. To this day there is no clear explanation why after over two hours waiting at the stop signal Roschek decided to make his departure. One suggestion made at the enquiry was that after two hours staring at the blue shunting signal (Tm4 on diagram) Roschek’s eyes deceived him; the red light on stop signal appeared to him not as red, but as orange – ‘proceed at caution to the next signal’. Nevertheless it should have been clear to Roschek or his second man that they were proceeding ‘wrong line’ a manoeuvre which requires special authorisation before it can be permitted. Railwaymen found it difficult to believe that a driver as experienced as Roschek could have made such a basic mistake and after the accident rumours abandoned that there had been a ‘third man’ in the cab of the ‘Gagarin’ who had forced the crew to make a departure, and who leapt out just before the crash. The crash joins a list of unexplained ‘accidents’ during term of office of Edward Gierek’s, first secretary of Poland’s communist party – the explosion of the Rotunda bank building, and the fire on the Most Lazienkowski bridge a few weeks before the scheduled opening of Warsaw’s first urban express way. At the time it was given minimum publicity and public attention soon moved back to developments in Gdansk. In the Autumn of 1981, a book about the accident Pociąg nr. 5130 (Train 5130) by Zbigniew Juchniewicz was published, shortly afterwards on December 13 martial law was declared in Poland and all unsold copies were seized by the censors. Yet railwaymen have never forgotten, and to this day as trains pass the accident site they sound a warning on their horns memory of those who lost their lives in the accident.